"Misty Hyman and her coach Bob Gillett of the Arizona Desert Fox Swim Team pioneered the extended underwater dolphin kick breakout nearly four years ago. . . . The theory behind Hyman kicking underwater on her side is based on the belief that a swimmer can fill the water with energy releasing vortices. The impetus for this unauthodox maneuver was based on an article published in the March 1995 issue of Scientific American, titled "An efficient swimming machine." In the article, authors Michael and George Triantafyllou share their research findings on how fish utilize spinning eddies to boost their swimming speed. Coach Gillett extrapolated from the article and applied the knowledge to Hyman's underwater breakout. His idea was to have Hyman turn onto another plane so that the spinning vortices that she created with every dolphin kick would continue to generate energy without being interrupted by running into the surface of the water or the bottom of the pool. He tested his theory by releasing food coloring behind Hyman's normal dolphin kick. The food coloring revealed swirling vortices that measured 10 feet wide. According to Gillett, "That is when it became apparent to me that there was a great amount of energy swirling beneath the surface of the water." There are some questionable features concerning the beliefs that surround Misty Hyman's underwater kicking in butterfly races. Underwater kicking in butterfly was established well before Misty Hyman was encouraged to attempt it. Angela Kennedy and her coach Peter Freney of the Telopea Club in Australia had perfected an extremely effective underwater kick that propelled Kennedy to world records in 50 m and short-course butterfly events. This writer recorded Kennedy achieving a velocity of 2.03 m/s performing her kick. She used that kick with effectiveness in backstroke and freestyle as well as butterfly events. The first theoretical problem is that vortices (eddies) are caused by a swimmer's movements; they do not assist a swimmer's movements. There have been some theories proposed by swimming people suggesting that vortices are important in swimming propulsion. That suggestion is not supported by any sound principle of fluid mechanics. There are occasions when vortices can assist a body in a fluid. Those vortices have to be sufficiently large to contain the body and going in the appropriate direction so that the relative velocity of the fluid is reduced. Pelagic aquatic creatures use huge vortices in ocean currents to assist their migrations and territory coverage. Similar "assists" are used by birds when soaring and in migration. However, the vortices in a swimming pool do not provide such assistance. A swimmer cannot "utilize spinning eddies to boost their swimming speed." However, there are some times in some sports when "trailing eddies," that is, the turbulence of drag, can be of assistance to another athlete and that is known as "drafting." As a swimmer accelerates, the size of eddies created increases. However, by the time a swimmer returns to the same area of the pool, those eddies have usually dissipated. In important races pool circulation is stopped to reduce water movement. During a race a pool's volume is not stationary as all swimmers disturb the water. The size of the disturbance created by a swimmer can be detrimental to a swimmer in a close lane when that swimmer encounters moving water. Lane ropes are supposed to suppress the travel of moving water into adjacent lanes but that cannot be fully achieved. Eddies that result from movement through fluids do not "continue to generate energy." They dissipate and lose energy because more and more water molecules are moved less and less. Having "Hyman turn onto another plane so that the spinning vortices created with every dolphin kick would continue to generate energy without being interrupted by running into the surface of the water or the bottom of the pool" would have the effect of affecting other swimmers in a race but would not assist Hyman in any way. Having Misty Hyman turn a quarter of a revolution and back again during a turn in a butterfly race would cause a detrimental loss of energy that is greater than any benefit that could be derived from the maneuver. The turn itself would have to be performed in a segmented sequence which would cause an increase in resistance and require an unnecessary expenditure of energy. Misty Hyman's turn is oriented downward. That means extra effort to swim in that direction, which is not the competitive direction, would also have to be expended. The following image is the typical position that is described as that achieved Misty Hyman in races (adapted from Rutemiller, 1996). However, any dispute can be resolved by proof. 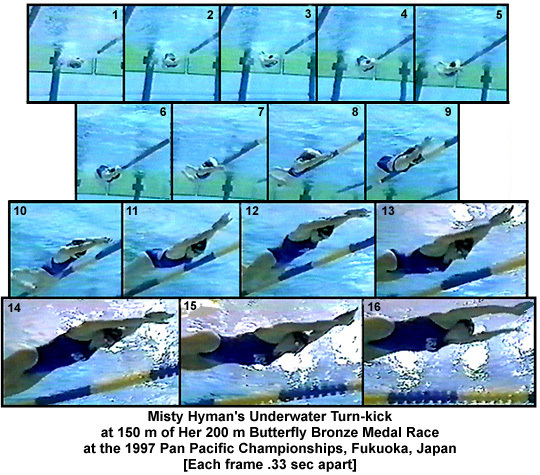 The following underwater sequence is of Misty Hyman's underwater activity at the 150-m turn of her 200-m butterfly race at the 1997 Pan Pacific Championship. At this stage of the race the swimmer is markedly fatigued. Each frame is .33 seconds apart. Frame #1: This is .33 seconds after release from the wall in the push-off. The swimmer is flat. Frame #2: The swimmer remains flat. Frame #3: The swimmer has rotated to 22 degrees. Frame #4: The swimmer has rotated to 35 degrees. Frame # 5: The swimmer has rotated to 40 degrees. Frame # 6: The swimmer has rotated back to 34 degrees. Frame # 7: The swimmer has rotated to 48 degrees. Frame # 8: The swimmer has rotated to 53 degrees. Frame # 9: The swimmer has rotated to 44 degrees. Frame # 10: The swimmer has rotated to 35 degrees. Frame # 11: The swimmer has rotated to 23 degrees. Frame #12-#16: The swimmer is virtually flat. This sequence illustrates the following phenomena. Misty Hyman never achieves the position that is normally described for her or illustrated in the above photos. The change from flat to incline and back again is not smooth. This suggests that for an underwater double-leg kick, rolling onto the side is difficult to achieve. It is quite possible that it is against the forces of better hydrodynamics. The swimmer takes longer (2.6 seconds) to attain maximum rotation (53 degrees) than to return to flat (1.33 seconds). This too suggests that rotating while doing a double-leg kick is difficult for this swimmer. At no time is the swimmer stable and on her side. She is either flat or rolling. Attempting to perform a double-leg kick on the side is a fatiguing unnatural activity that is not beneficial to butterfly stroke racing. At some stage the question must be asked: "Dolphins do not swim on their sides to mimic fish so why should humans?" The reasoning behind "copying" both fish and dolphins in the same swimming event can be criticized severely. Rutemiller, B. (April, 1996). Tech tips: Misty Hyman. Swimming World and Junior Swimmer, 37(4), 22-23.